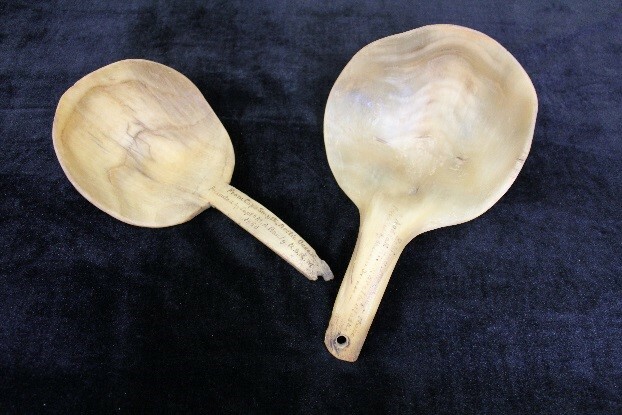 The Sheldon Jackson Museum’s June Artifact(s) of the Month are two Inupiaq mountain sheep horn spoons or dippers (SJ-II-T-28 and SJ-II-V-26). The larger of the two sheep horn dippers was collected by Sheldon Jackson from the Noatak River, while the smaller, shown on the left in the adjacent photograph, was collected from Point Barrow by Captain Michael Healy of the US Revenue Cutter Service. The dipper was just one of nearly a half dozen artifacts given to Sheldon Jackson by Captain Healy, an ambitious, driven man and America’s first African American sea captain. Michael Healy was born to a slave and plantation owner and had worked his way up the ranks from cabin boy to officer to Captain just as America was emerging from its Civil War. Known for his skill and bravery, he patrolled the rugged coastline of Alaska in the icebreaker, the Bear, overseeing every vessel in the Pacific Revenue Cutter Fleet and spending much of his time in remote, dangerous waterways, rescuing whaling ships caught in the ice, and transporting Siberian reindeer alongside Sheldon Jackson to Alaska Natives facing food shortages. Sheep horns have traditionally been used to make ladles, dippers, and spoons by the Inupiat, Tlingit, and Haida. The process of making them is similar among the different cultural groups - one steams the horn, bends, and presses it into a shape, often with a wooden mold. After being shaped into form, the surface of the mountain sheep horn, initially heavy and coarse in grain, is made smooth with a scraper. Sheep horn ladles and spoons tend to be made more or less the same shape though they vary in overall size, bowl width, and degree of embellishment. Sheep horn spoons and ladles among the Inupiat tend to be rather plain but among their Northwest Coast counterparts, the handles are often carved or embellished with inlay. All mountain goat horns spoons are initially light yellow and translucent, but over time, can appear more beige in color. Among the Inupiat, dippers of horn like the June Artifact(s) of the Month have traditionally been used for drinking water. Narrower, shallower ladles and spoons were also used for stirring and ladling soup, for eating, and or dipping oil, especially when filling oil lamps that lit and heated the qasgiq and home. The Inupiat also made spoons and ladles out of bone and wood. The Sheldon Jackson Museum is home to over one hundred spoons, dippers, and ladles. The majority are Inupiaq and Yup’ik and made of sheep horn, wood, or bone, but there are also many examples Tlingit mountain goat and sheep horn spoons and spoons that combine the latter two materials. The June Artifact(s) of the Month will be on exhibit until June 30th. Visitors may see these artifacts and other accouterments in the collection at the museum during operating hours - Tuesday through Saturday between 9am and 4:30pm. General admission is $7, $6 for seniors, and free for those 18 and under or members of either the Friends of the Sheldon Jackson Museum or Friends of the Alaska State Museum. Captain Healy’s identity was a black man was not known to the Revenue Cutter Service during his lifetime. At the time, the Revenue Cutter Service would not have allowed him to enter service and had he been found out, he would have been expelled due to discriminatory practices of the day. Browse more Artifacts of the Month on our website.